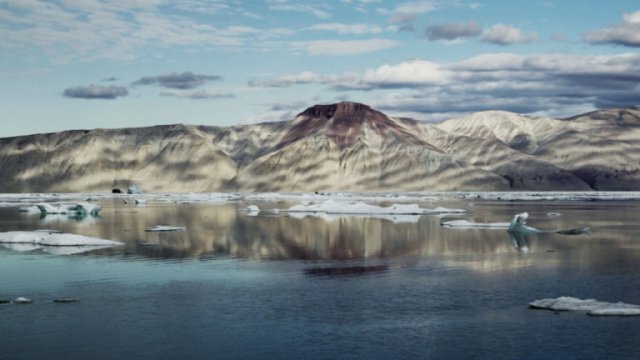 A three-masted schooner packed with artists, scientists, and philosophers sets off on a grand journey to one of the last uncharted areas of the globe: the rapidly melting massifs of Northeast Greenland. A beautiful thing to behold. Witty musings on the cosmic circle of life. A fascinating meditation on the different ways nature can be experienced. A beautiful/scary documentary about climate change. Perfectly captures the wonderment of Greenland. Manages to mesmerize and evoke ecological anxiety at the same time. Some of the most stunning landscape cinematography imaginable. The film helps you to look at the earth, so majestic, so superb, and to want more than ever to be aware. Mesmerizing and spectacular wilderness documentary. Courses with the zeal of Robert Flaherty, the fearlessness of Werner Herzog and the fatalistic humor or Lars Von Trier. A GORGEOUS, SURPRISING, meditative film. Opens up one of the world's last unknown places. A documentary of pure exploration....visually intoxicating. Captures nature at its most pristine and awe-inspiring. The amazing imagery of stony beaches and stubbornly frozen fjords suggests nature's utter indifference to human presence, a well-trodden theme here given an entertainingly tricked-up treatment. Visually ravishing, thought-provoking and benefitting from just enough playfulness to set it apart from the nature-doc herd. Do not miss out on this visually wonderful journey. An incredibly well-orchestrated and integrated documentary. A magnificent documentary about the meaning of life.